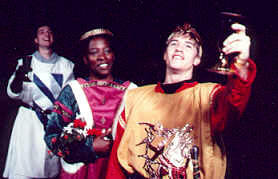 ArtReach's Knights of the Round Table is a dashing dramatic script for touring to Middle Schools and High Schools! 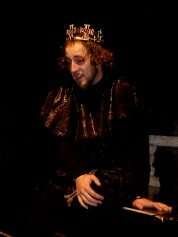 Producers, you will love this One Act Play with great opportunities for exciting swordplay! The background music CD soundtrack is haunting, dramatic and captivates the audience! 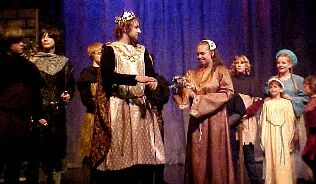 This one act play for young audiences was developed by ArtReach Touring Theatre, written especially for touring to schools. Tips on very creative staging keep sets and costumes to a minimum. Everything fits in your touring van! One Act Script for Young Audiences! 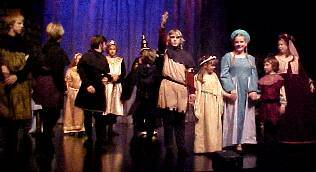 King Arthur's Camelot Drama for Kids! Knights of the Round Table tells the story of King Arthur's life: from the moment he pulls the sword from the stone to the day he conquers over evil forces to claim Camelot and assume the throne. "You dazzle both adults and children away to your world of magicians, knights and dragons! Thank you for the chance to be swept back to King Arthur's time of courage, bravery and honesty." As Arthur pursues Excalibur, the enchanted sword, the classic characters come to life: Merlin, Guinevere, Lancelot and the Lady of the Lake. "Instead of Disney's testy, bungling eccentric, Miller's Merlin is intense and cloaked in mystery. Miller's dialogue contains some beautiful and funny passages." Touring: 2 men and 1 woman, includes suggestions for easy touring. Medium Cast: 5 men and 3 women. Knights of the Round Table has a Companion Play! 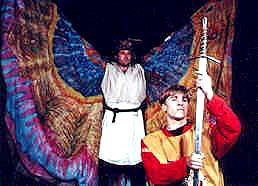 Sword in the Stone may be performed with Knights to make a two hour production with intermission. 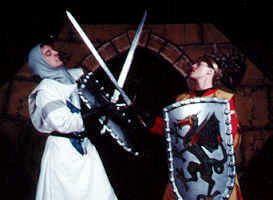 The Laguna Playhouse's Joe Lauderdale found great success using Knights and Sword together to create a full length, mainstage production.